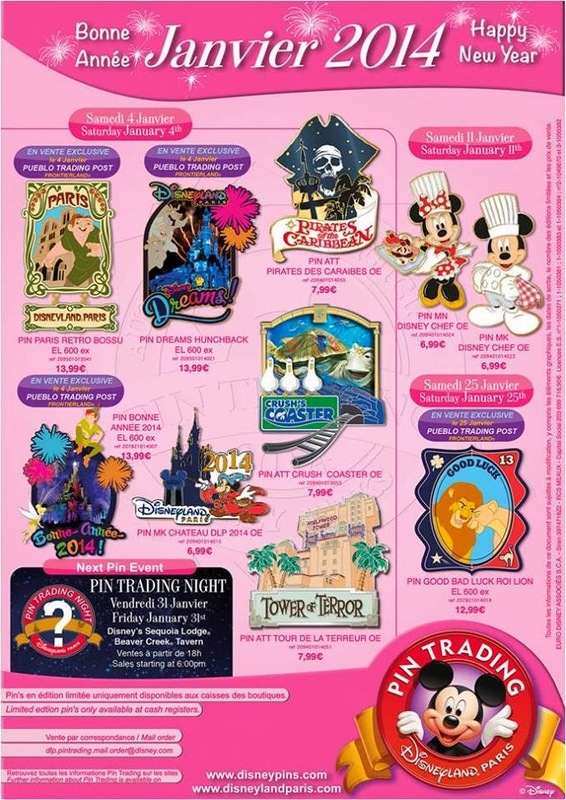 We’re heading towards the final week of the year, and so it’s time for another new pin trading poster. And it’s good news all round, this month sees some absolutely fantastic pins! Saturday 4th January really is a bumper pin day in Disneyland Paris with no less than 7 pins released. The first of which is a Paris limited edition piece featuring Quasimodo in front of Notre Dame, this is a nice looking pin, but is perhaps a slight bit underwhelming compared to the rest of the weeks releases. Another Hunchback pin will be released on the same day as the Disney Store’s website collection continues over in Disneyland Paris (making completing the set for the majority of Europeans a much more difficult task – and a move I’m really not fond of). The pin itself is rather nice and features perhaps one of the most beautiful scenes of the Dreams! show. This will be very highly sought after. The final limited edition pin of the month is actually last month’s Happy New Year pin, which will actually be released in the New Year – a move which makes a lot of sense. The attractions collection continues for a second month with three stunning pins depicting Pirates of the Caribbean, Crush’s Coaster and the Tower of Terror. Collectors will be pleased to see this beautiful collection continue to evolve. The final pin to be released on the 4th January is the traditional yearly sorcerer Mickey pin. One I’m sure many of you will be adding to your collection. Saturday 11th January sees a Mickey and Minnie chef pin being released, excellently timed for the Ratatouille themed ride later in the year. Finally Saturday 25th January sees the continuation of the Good Luck/Bad Luck series that we have seen been released over the last six months or so. These pins have not proven to be the most popular despite their rather nice design. Overall, a fantastic month for pins, and I can honestly say that it is a month in which I would buy all the pins given the opportunity. 2014 seems set to be a fantastic year for pins. See our preview of what’s to come later in the week.